To provide stimulating careers and a caring work environment to our employees. To contribute meaningfully to our world, our field and the community in which we work. Innovation, Customization & Themes-We have a unique ability to bring specific themes alive through travel. Akbar Travels of India, the parent company founded in 1977 is the leading ticketing agent for all the major airlines operating in India. The head office of Akbar Holidays is conveniently located at Standard Plaza chamber, RD Street, Fort, Mumbai. Akbar Travels of India has excellent market coverage of Mumbai with 15 offices in the city. All metros and other towns in India are covered by the 55 IATA approved ticketing offices and 20 non-IATA offices. Akbar Holidays is progressively placing well trained holiday staff at all the Branch Offices. 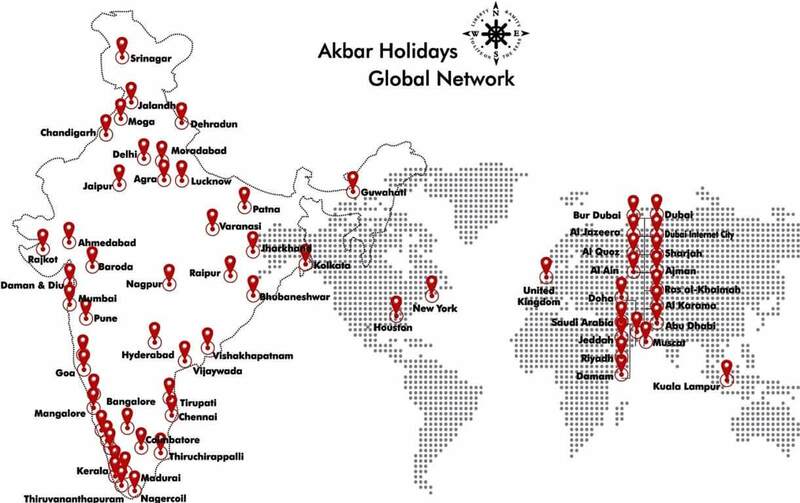 Akbar Holidays was set up under the online travel portal www.akbartravelsonline.com to meet the ever increasing demand for flexible domestic and international holiday packages from India. It is headed by Ms. Benzy Nazar, an experienced organizer of leisure packages for both corporate houses and individuals. It is rejuvenating to discover diverse cultures and lifestyles across the globe. You can find your perfect international holiday or honeymoon package; from Cape Town to Amsterdam, Manila to Los Angeles; Akbar Holidays will assist you to journey through the world! Check out our holiday packages and discover irresistible travel deals to the most exciting international destinations across the globe! Our exclusive holiday packages are specially designed to ensure you have the time of your life with value for your money. • Individual Travel: This covers travel by individuals and families. Flexible itineraries are prepared to suit the taste of each individual. • Group Travel: Group travel is when a group of minimum 10 passengers travel together. Group travel is most economical, because lower air fares are available for groups on most of the airlines. Also for larger groups, the cost of accommodation and transportation will be proportionately lower. • MICE Travel (Meetings, Incentives, Conferences, & Exhibitions): Corporate houses these days have various travel needs for their staff and customers. Meetings and conferences are organized in exotic destinations, where all facilities are available for business and leisure. Incentive travel is arranged for dealers and agents who perform well and need to be rewarded and motivated. Trade Exhibitions happen in various cities of the world attracting traders and importers. Akbar Holidays has the expertise to look after all types of corporate travel. • Cruise Bookings: Cruising is getting more and more popular in India. Many Indian travelers go on Cruises to different parts of the world. Star Cruise is the most popular cruise company in Asia. Akbar Holidays also book cruises in prestigious Cruise Liners like MSC Cruise, Carnival Cruises and Royal Caribbean. “Affordable and hassle-free holidays tailor-made to suit individual choice” is our motto. We trust the word-of-mouth publicity generated by our satisfied customers would help Akbar Holidays to grow and become one of the leading leisure travel specialists in India.